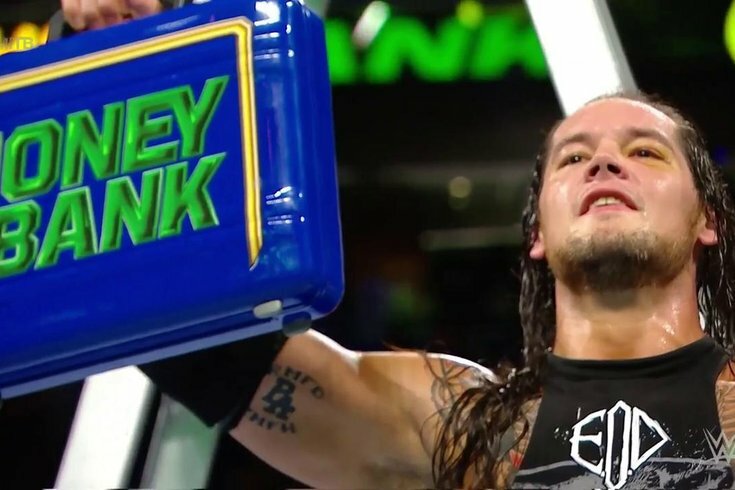 Baron Corbin won his first Money in the Bank Ladder Match Sunday night in St. Louis. The Scottrade Center in St. Louis was the epicenter for SmackDown’s Money in the Bank pay-per-view on Sunday night. It’s been one of the most important nights on the WWE pay-per-view calendar as the audience gets a preview at who likely will become a WWE Champion and SmackDown Women’s Champion in the near future. The Women’s Money in the Bank Ladder Match kicked off the main card, and I was really hoping it would set a positive tone for the night. Some may think differently, but while the beginning of the night didn’t look too promising, by the end, I felt like this was one of the better pay-per-views of the year. It would’ve been silly to have a heel turn on a preshow match, right? Right. Zack Ryder hit the Hype Ryder to get the win for his team in his first match back from injury. This match had some really good spots, which proved right away that it was the right idea to put these women in this match. Shortly after the match began, there was a “This is awesome!” chant from the crowd. Charlotte Flair really provided the high spots of the match, and she was my pick to win the match to add to her already stellar résumé. But, alas, that wouldn’t be the case. As Becky Lynch ascended the ladder for a chance to become the first-ever Ms. Money in the Bank, James Ellsworth would get involved. He pushed the ladder, sending Lynch crashing into the ropes. He then was set to help Carmella to her feet but decided to ascend the ladder himself, unhook the briefcase and toss it to Carmella, who was sitting on the mat. The referees called for the bell, and despite arguing that Ellsworth wasn’t in the match, the final decision was that Carmella had won the first-ever women’s Money in the Bank Ladder Match. This match kind of started out slow, but then it really picked up. That always seemed to be the story when these two teams fought over the titles a few years ago. Kofi Kingston took a sick dive to the outside when one Uso pulled the ropes down as he was thrown in for the Irish Whip. But, it looked like New Day was going to win the SmackDown Tag Team Championships after they hit the Midnight Hour, but The Usos were able to bail out from the pinfall attempt. When all the momentum was on New Day’s side, Jimmy and Jey decided to take a hike and got counted out. This match was better than what I was expecting. Naomi and Lana had an entertaining match that saw Lana hit her sit-out Alabama slam that actually had me thinking she’d become the new SmackDown Women’s Champion. Naomi kicked out, and then Carmella wound up coming out to cash in her Money in the Bank briefcase. After thinking about it, she then pulled it back and decided not to, allowing Naomi to capitalize on a distracted Lana. Naomi locked in the FTG [short for Feel the Glow] and made Lana submit. Carmella teased again cashing in her briefcase, but decided against it. This match definitely had an old school feel to it. From Orton “hurting” his left knee in the beginning of the match to Mahal continually attacking it slowly and methodically, this definitely felt like a match to get Mahal over as a legit threat instead of a paper champion. The Singh Brothers didn’t come into play until after Orton hit his RKO, which was telegraphed and not out of nowhere when they put Mahal’s foot on the rope. The referee would eject both of them, but they wound up never leaving ringside. They decided to try and attack Cowboy Bob Orton, who was seated with some St. Louis wrestling legends in the front row during this match. [By the way, it was very cool for WWE to acknowledge them.] Orton wound up attacking both Singh brothers and completely destroyed them. Then, as he got back in the ring, Mahal had recovered and hit him with The Khallas to retain his championship. A funny “Fashion Vice” vignette set this match up. Fandango cradled Viktor to get the win. Nothing more, nothing less. Before the match even began, Baron Corbin attacked Shinsuke Nakamura during the beginning of his entrance. The greatest entrance in pro wrestling, might I add. Talk about adding some heat to the match from the get-go. The match overall was pretty great. It really saved a show that up to that point, was flirting with a very mediocre feel. These guys really worked as hard as the women to make this match as good as it possibly could have been. We saw some crazy moves that actually made me cringe while I watched. Sami Zayn’s sunset flip powerbomb from the top of the ladder on Dolph Ziggler comes to mind. Even though we’ll ignore the fact that he probably could have grabbed the briefcase right then and there. Then, right after that, Zayn delivered a half nelson suplex to Kevin Owens on the ring apron. The ring apron! As Zayn began another ascent on the ladder, AJ Styles came out of nowhere to hit the Phenomenal Forearm to save the match for the others. Then, he went after Corbin on the outside, who caught him with a chokeslam through a prone ladder. After Styles recovered, he would hit Owens with his own version of the Attitude Adjustment on Owens onto the same prone ladder. After, Corbin was ready to grab the briefcase when Nakamura’s music hit once again, and the King of Strong Style made his way to the ring and made his mark in the match. He pretty much destroyed everyone in his path before he came face-to-face with Styles. As Nakamura was setting up the ladder, Styles peered at him through the other side. Calmly, both moved the ladder to the side and then went at it one-on-one. That was a pretty great moment, and one that I think foreshadowed either a SummerSlam or WrestleMania match. If I were a betting man, I’d bet WrestleMania. While both Styles and Nakamura were perched atop the ladder, Corbin returned to shove the ladder, therefore sending both Styles and Nakamura crashing into the ropes and mat. Then, the Lone Wolf ascended the ladder and grabbed the briefcase to become Mr. Money in the Bank. ●	While at first, I wasn’t thrilled with how the Women’s Money in the Bank Ladder Match ended, I definitely could see how Ellsworth’s portrayed as Carmella’s puppet. If they were going for that, that’s a good storyline. Because of the condition Carmella was in, Ellsworth realized she probably couldn’t climb the ladder herself to grab the briefcase, so he did. It served the same purpose it would have had Carmella had her wits about her while on the mat and told Ellsworth to climb the ladder for her to retrieve the briefcase. So, let’s see how this plays out. A lot were angry over the fact a man had to get involved during such a historic match, but this is a huge storyline heading into SmackDown on Tuesday night. There could be more coming. ●	The Usos really have become so much smarter as a heel tag team. That makes them so much more enjoyable than the lovable babyfaces they were for years. New Day not trying to break the referee’s count doesn’t make much sense, but this will set up a rematch, and when The Usos and New Day get together in the ring, good things happen. ●	Carmella teased cashing in her Money in the Bank briefcase during the Naomi-Lana match, but then opted against it. I think this was good for the night, but if she keeps teasing and then not cashing it in, it’ll get real old, real fast. I’m very interested in seeing how this storyline progresses on Tuesday night. ●	WWE is really playing up Maria Kanellis’ return to the company. They’ve made Mike Bennett adopt her last name, so he’ll now go by Mike Kanellis. And they’re not acting like she’s some newbie - she’s going to be legit. She could even give the women’s division a boost should they decide to have her wrestle and manage. I’m really looking forward to how these two are used on the main roster. ●	I loved the interaction between Nakamura and Styles during the main event. Is that a WrestleMania main event in New Orleans next April? It’s possible. And it needs to happen because that would be one of the best matches in WWE history. Let’s just hope WWE has that patience and doesn’t blow it off early at SummerSlam or even a random episode of SmackDown. ●	I mentioned on Episode 98 of The Straight Shooters that I felt Corbin would benefit the most from having the Money in the Bank briefcase. The angle was meant for someone like him and his character. Who would want to see Nakamura walk around with the briefcase? Even Styles? Sometimes, predictability is good, and if you’re not on the Corbin bandwagon, there’s still some room. He’s a good one, and he’s primed to show everyone why.